Over the years I have tried to expose the Boycott, Divestment and Sanctions Movement known as BDS. In its modern version, BDS is only 14 years old, but the concept is much older, and it could be argued that Kristallnacht, the November 1938 "Night of Broken Glass" in Germany, was an early, rather successful attempt at BDS against the Jewish people. I have also repeatedly stated that there is nothing wrong with boycotting, in and of itself. The concept is actually very commendable as it is an expression of one's deep convictions against a person, place, organization or any other entity that promotes ideas one cannot support. Many of us actually boycott without necessarily calling it by that name. Some will "boycott" R movies, others will boycott alcohol, while others will boycott a specific artist for the message they spread. We all do it. The challenge rests on the integrity we display as we boycott. We shouldn't claim to boycott R movies or a specific brand and then watch some R movies or buy some items made by that brand. Boycott is only ethical when it is done with integrity. It's all or nothing, so let's be careful before we commit! That is the biggest problem with the BDS movement, and it is identifiable on two levels. First, BDS proponents are very inconsistent with what Israeli products they boycott. If a product or technology comes from Israel but doesn't really create a huge inconvenience, BDS people will denounce and boycott with a lot of fanfare. On the other hand, if the technology is a big part of their life, like cell phone, computers, thumb drives, etc, hypocritically, there's no boycott. Case in point, Mahmoud Abbas recent case of severe pneumonia successfully treated by an Israeli doctor. It shouldn't come as a surprise that the UN has looked at Israel through the biased lens of the Palestinian narrative, fueled by a postmodern approach to truth and social justice. More resolutions have been passed against Israel than any other country combined that are UN members, and this by a long shot. The UN is no different with BDS. It identified 206 companies that according to them are doing business illegally in Israel as they stated: "The violations of [Palestinian] human rights associated with the [Israeli] settlements are pervasive and devastating, reaching every facet of Palestinian life. Owing to settlement development and infrastructure, Palestinians suffer from restrictions on freedom of religion, movement and education; their rights to land and water; access to livelihoods and their right to an adequate standard of living; their rights to family life; and many other fundamental human rights. Looking at that statement, it is blatantly lying about the Palestinian freedom of religion and education, by simply turning factual truth on its head. Palestinians do not suffer from restrictions on freedom of religion. On the other hand, try to freely and safely express yourself as a religious Jew in the "Palestinian territories" Good luck with that! Congresswoman Rashida Tlaib of Michigan said "I personally support BDS" and refuses to go on an organized trip to Israel for freshman members of the US government, but instead, she organizes a trip to the West Bank. Congresswoman Ilhan Omar of Minnesota also supports BDS. She said, "I believe and support the BDS movement and have fought to make sure people’s right to support it isn’t criminalized." Then you have the newest and youngest member of the US Congress, Alexandria Ocasio-Cortez who also will not join the AIPAC trip to Israel. In a recent interview, she was quoted saying, "I also think that what people are starting to see at least with the occupation of Palestine is the increasing crisis of humanitarian condition. And that to me is where I tend to come from on this issue." She has not made a clear statement in favor of BDS yet, but I fear that her disdain for Israel might soon show her true colors. Additionally, there seems to be some kind of political infatuation between the New Democrats (read "Progressive Left") and the woman behind the "Women's March", Linda Sarsour, who for several years now, has promoted radical Muslim agenda. Additionally, she has been known to show respect and admiration for the antisemitic leader of Nation of Islam, Louis Farrakhan. Miss Sarsour is very bold in her defense and promotion of the BDS movement. 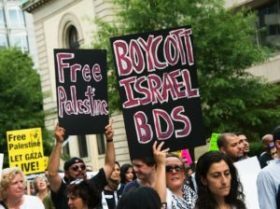 The Jewish advocacy group Stand With Us produced a short document explaining what BDS is all about, titled "Explaining the BDS Movement: BDS the New Antisemitism", well worth the read.